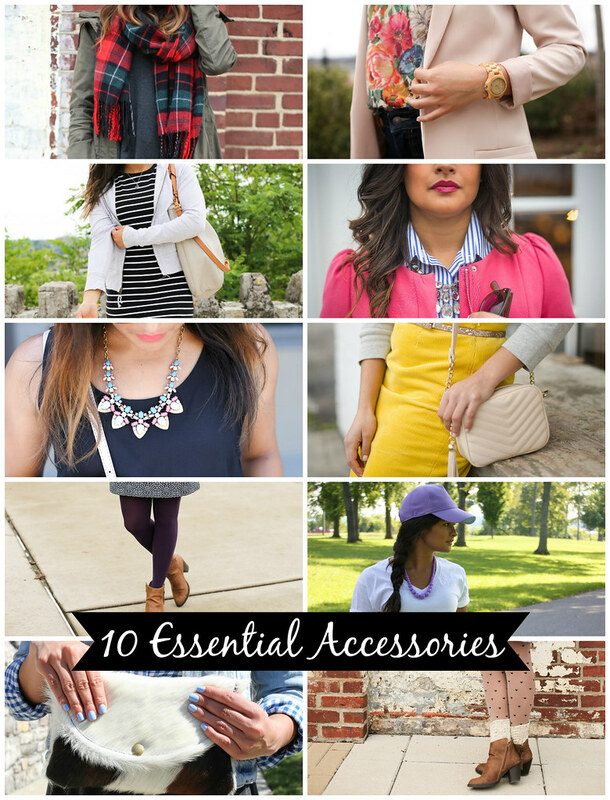 perfectly Priya's 10 Essential Accessories | Priya the Blog | life & style in Nashville & beyond! Last year I was excited to compile and publish my list of the ten most important pieces in my closet. I couldn't write that list without wanting to include some accessories, and realizing they deserved a list of their own! So today, welcome to part two in the series about my fashion MVPs. Accessorizing is equally as tough as it is important. The right accessories are truly the finishing touches that make an outfit special- they can make a black t-shirt look incredible, or a gorgeous dress look tacky. And considering that accessories are the easiest way to freshen up your closet, especially on a budget, or try out a trend you're a little wary of (leopard print anyone?) maybe it's time we paid accessories the attention they deserve. 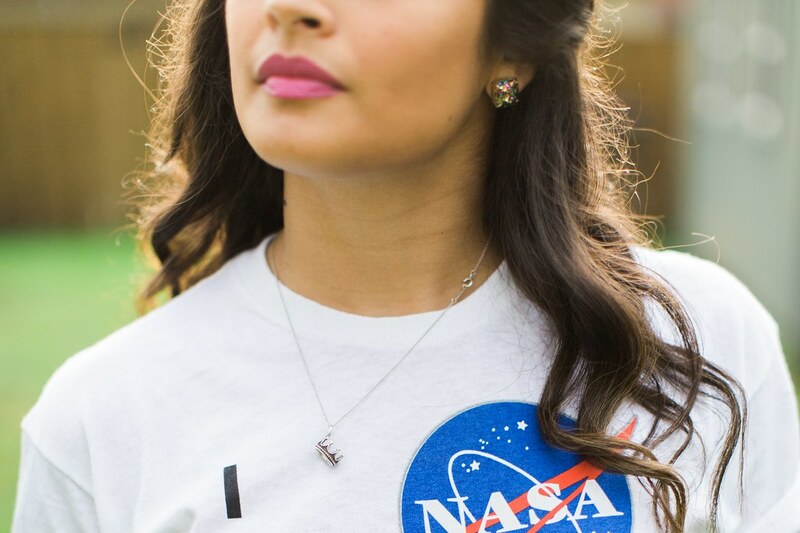 0. everyday jewelry | Accessorizing can be tough, especially if you are chronically tardy like me. Having a set of “default jewelry” that you put on every day, without thinking about it makes this a lot easier. On a daily basis I wear a simple necklace (usually my Tiffany’s crown), some stud earrings (lately it’s been faux diamonds from Target, or my Kate Spade glitter ones) and a watch (my JORD!) Think of this as a “base layer” to accessorize on top of. 1. a blanket scarf | Notice I say “a”, because I find myself wearing the same one or two all season long. 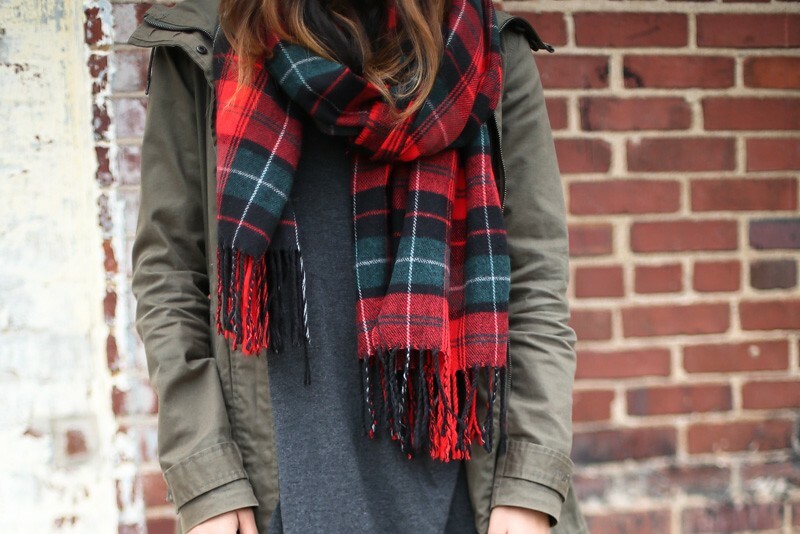 Last Winter it was my ^this plaid one^, this year it's been my Madewell Christmas gift, & I even wore my Summer scarf last season! By all means, rotate, if you can, but I’m in the camp that you really only need one that you can wear everyday. During colder months, I’m convinced a scarf tucked into a coat is the quickest way to look chic and put-together. 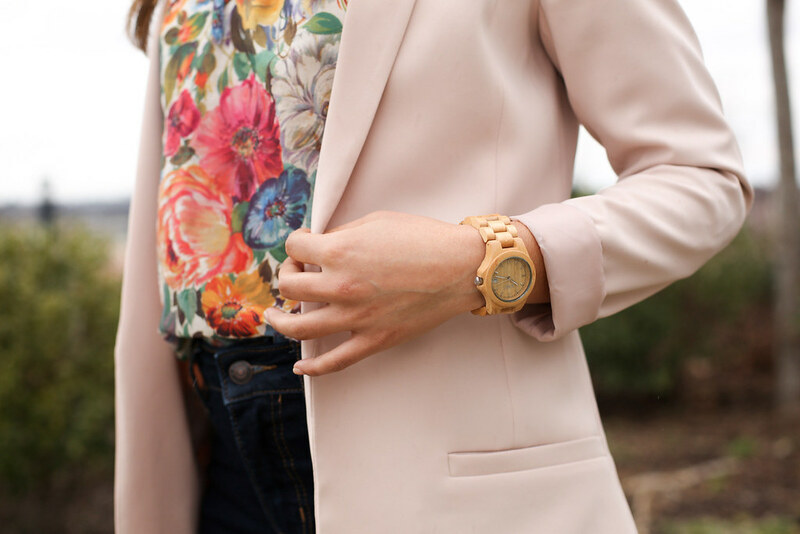 2. watch | JORD was kind enough to send me a watch to review about a year ago, and I can honestly say I love it and wear it nearly every day, and get compliments about as often (thanks JORD!) This one is super casual and lightweight, and I would love to add a girly, dressy, option into my rotation. Think of this as a functional bracelet. It is actually so handy to know what time it is without going down the rabbit hole that is your phone. 3. work tote | Previously I had too many work totes I felt “meh” about instead of one perfect one. But I got one for Christmas (this reversible one!) It is similar to the Madewell Transport tote, but I love that mine can be black OR brown. Something about walking into the office with a chic tote just makes me feel like I’m going to have a productive day, bonus that it translates into a purse for drinks after work. 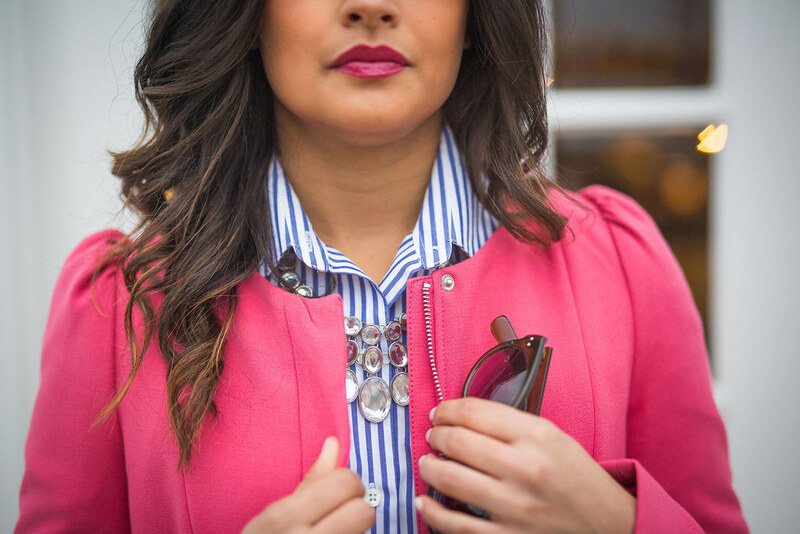 5. statement necklace | My other personal favorite way to accessorize, because once you have a statement necklace on, you need very little else! I was gifted a blogger fave J.Crew statement necklace that I love, I would also recommend having a faux diamond and “50 Cent chain” in your arsenal. 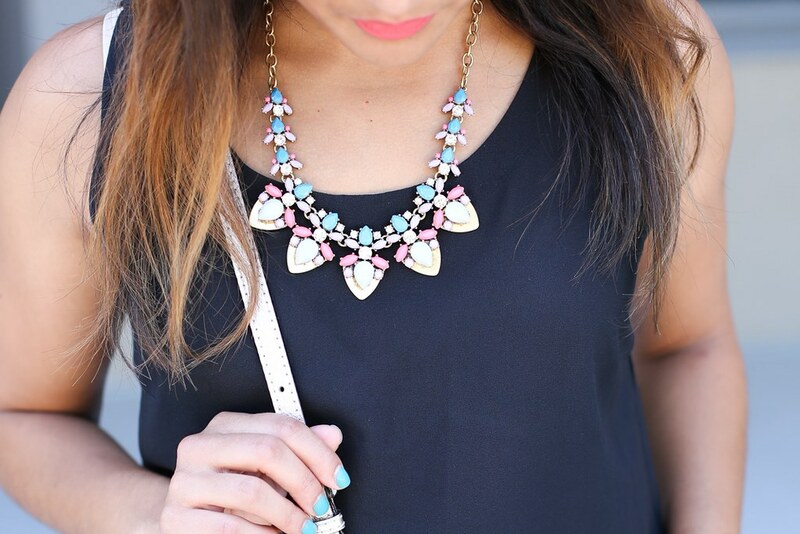 Add studs and call it a day. 6. cross-body purse | If I’m not headed somewhere straight from work (with a work tote ^), you can bet I’m carrying a cross-body (lately it’s my Kate Spade.) A lot of days I go to work with my cross-body tucked into my ^work tote^. Having a reliable cross-body WILL make a difference in your life- if only because you can be hands free in the club. 7. tights | Cold-weather accessorizing is the cutest, but can also be the most overwhelming. I started wearing tights as often as I could in high school, and have amassed quite a collection. Tights can make pretty much anything cold weather ready, and don't limit yourself to black! Opaque, sweater, patterned, & colored tights are all a fantastic way to add some visual interest to a drab Winter day. 8. baseball cap | File under "functional accessories that are also high fashion." I've been known to go as long as possible between hair washes, sometimes even one day too many. And on these days, I look no further than my small collection of caps. My absolute favorite is pairing a baseball cap with a girly outfit, so unexpected that it just works! 9. fun clutch | While you need a neutral ^cross-body bag^ and a professional looking ^work tote^, a clutch is the perfect place to go a little wild. In such a small dose, you really can't do any harm! As evidenced by the clutch above that I was "force-gifted" and then realized, why not? Especially considering you're most often using a clutch with an LBD or something boring and formal. 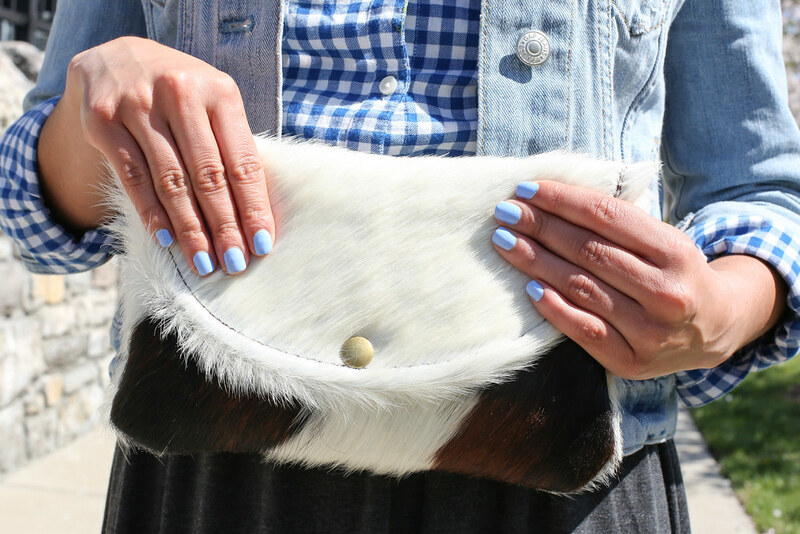 Let your choice of clutch show off your personality! I'm a cow! And I'm dying for a fold-over leopard clutch. Kate Spade actually makes one that SAYS "fun" which makes me lol. 11. clogs** | I don't even have to tell you how much I love clogs- you already know! They're adorable, totally on trend with the current 70's vibes, a nod to my Scandinavian heritage, AND the thick heel makes them so comfy to wear all day. This is a bonus one that's a teaser to the third and final installment of this series, perfectly Priya's 10 Essential Shoes. All ten items in one handy image, for your reference! What's on your list of Essential Accessories? Is there one thing you never leave home without? Anything seriously missing from my list? Let me know in the comments!